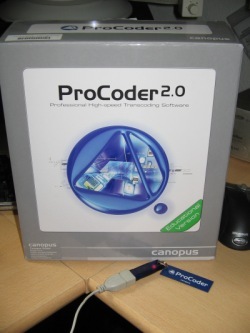 A couple of months ago we got us a Canopus ProCoder 2.0 educational version. Because we, well had to convert a shitload of MPEG2 and DV movies into several different formats. And because Canopus is telling us that their product is by far the best you could probably get on this planet, we were in. There is a free demo version available which does not require the red glowing, blue plastic HASP hardware USB dongle key’i thing we got with the full version. Those kind of dongle stuff is really nasty. First of all it bugs you right after you got your Windows started up with an error message, just because you probably haven’t plugged the dongle in. The point here is though: Why checking this at the system start, why not when ProCoder 2.0 is started. And heck! Why a dongle key’i thingy anyways? 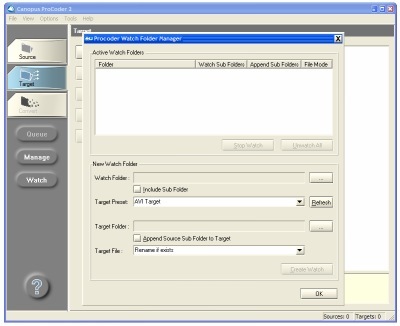 ProCoder 2.0 has a neat little feature, the only feature why I would use ProCoder personally, which is called “Watch Folders”. 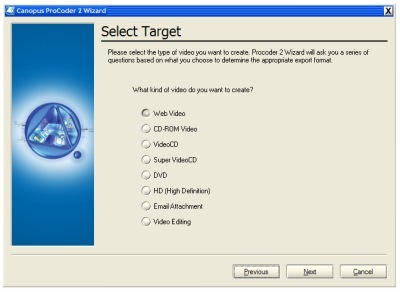 You take a ProCoder 2.0, set it up to watch a folder on a network storage or anywhere you like, and after you setup’d some target movie formats it’ll start to convert everything that appears in those Watch Folders and transcodes it to whatever you configured as a target. Great feature! But here comes the dongle right back in: You need to go to the server room, find your powerful number crunching server park and stick the… well dongle… into… great. After you recovered from the headache and tinnitus (dramatisation!) you got your ProCoder “server” up and running. The point here is: Why all that fuss with that dongle usb stuff. 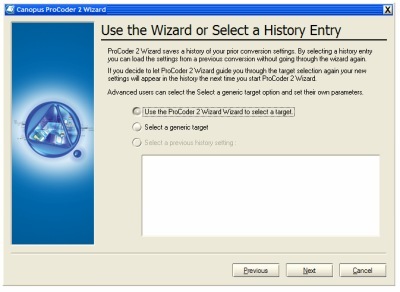 What’s wrong with serial numbers which are necessary anyway for ProCoder 2.0? Piracy can’t be the answer here. Maybe they want to pretend that it’s worth even a dongle, like AutoCad was back when we called our operating systems DOS. So back to the Canopus ProCoder 2.0 test: After the setup it comes in two different flavours: The fast and the furious, called “Canopus ProCoder 2.0 Wizard” and the all-inklusive one, called…you get the idea. 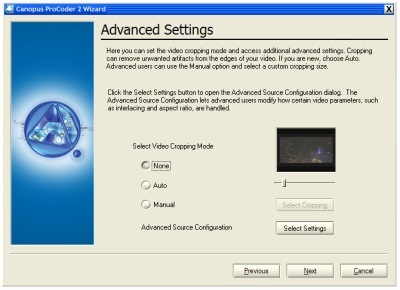 So first of all let’s cover the Wizard because the workflow of the Wizard is likely the same as in the ProCoder 2.0. 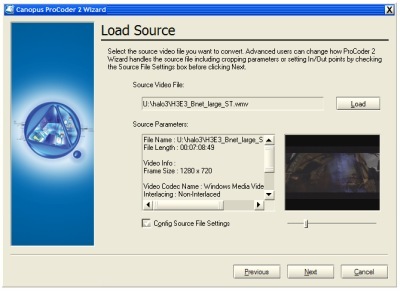 I used the current Halo 3 Trailer for demonstration…it’s a WMV HD. You can specify where the movie starts and where it ends. So you have some kind of cut-editing capability…well not really. I flinch from calling it cut-editing actually. Well Canopus things that Crop-Settings are advanced. But hey, there is a “Select Settings” button which opens a dialog where you can specify alternat audio, specific aspect ratio and so on. Nothing to yell about there. Tricky decision here. We want it HD! Step 7: a question of format. 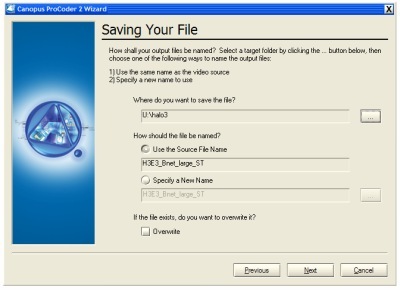 In the end the wizard sums everything up and you can press some more advanced output setting buttons. And if you’re done, you click “Convert”, finally. And the evil boffins in your number crunching server park are starting to convert your source movie into whatever target you selected. If it doesn’t do this. Well you will never know why it didn’t do it. Because Canopus choosed to not use any error messages or logging. You can be lucky if you get a dialog box telling you that it just won’t do it. In 9 out of 10 cases it just wasn’t telling anything. It’s not particularly slow. In fact, if you just transcode something and you’re not using any additional filtering it’s as fast as any other transcoding tool (which come sometimes without dongles, you might have heard that). So that’s quite everything what’s to be told about the Canopus ProCoder Wizard. Finally let’s take a look at the one feature I love: Watch Folders. 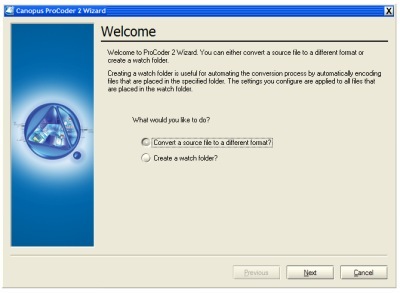 I just want to say something about the GUI of ProCoder 2. About GUI design in general. And I want to start with a simple question: What is wrong with standard system controls? 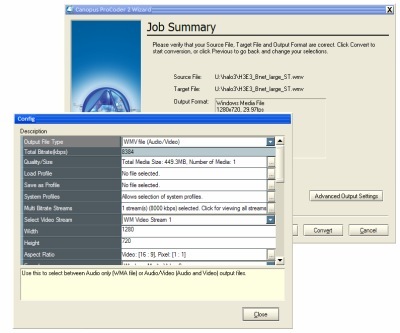 Why are many software companies are writing their own scrollbards, buttons, dialogboxes, tabs. Why can’t they just use the system wide available ones? The ones that actually work. The ones that draw correct on any machine. The ones that I’ve never seen blinking or be drawn incorrect. In case of Canopus ProCoder 2.0 the custom-made scrollbars sometimes even disappeared and you could see that they where just drawn above the system scrollbars. You software companies. If you take an advice from me: stick to doing the user software and leave the multi-purpose GUI elements to the operating system. Nothing really to write more about than: Everything is intuitive and works out of the box. Select a folder. Select a target. And you’re done. It just works as promised. 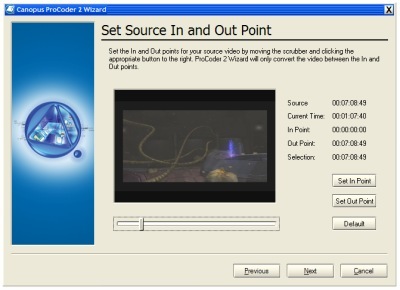 And if you’re in luck and your movies are in a format that ProCoder 2.0 can read without hassle it even will work with your movies. Since there’s nothing to complain about the pre-configured formats you are certainly not going to have much fun setting up very very custom things. Like the time when I wanted to just setup my own MPEG-4 target. 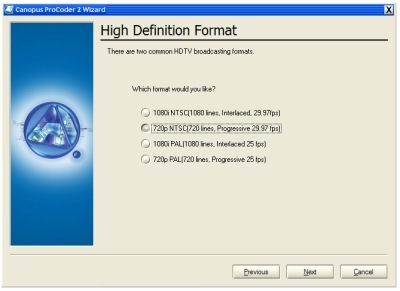 Which isn’t that easy because when you select the MPEG format you only can choose from MPEG-1/2 formats. Or the other time when I wanted to do it in H.264. That format is available, but you have to find it. It’s deeply burried into the third dialog-layer. In the end you get quite a good transcoding application with this neat Watch-Folder feature. You also get an awfully rubbish GUI with no error messages at all. If something goes wrong you’ll never know why. In our case everything went fine and in only one case in my testing I found something that the Windows DirectShow could decode but ProCoder 2.0 could not. 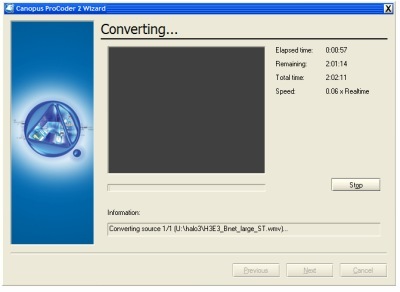 I really recommend it for video encoding servers. It’s one of it’s kind when it comes to that discipline and the money is well spend.